John Vonderlin: Was it really a sunfish? 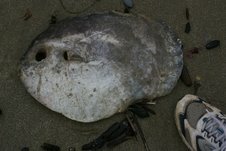 John wanted to make certain that the “thing” he found at the beach was, indeed, an ocean sunfish. Like everything else, they are more beautiful in life. To confirm what he found, John emailed Tierney Thys, who maintains oceansunfish.org. bony fish and slightly negatively buoyant when in the water. Thanks heaps for passing along my website information. Much appreciated.